"Roger Raymond Collard, Westbrook College, Class of 1975"
Westbrook College student Roger Raymond Collard, Class of 1975, was a Nursing major and a Day Hop. For his senior class candid photo, which appeared in the 1975 Tower Yearbook, he wore a plaid check flannel shirt over a pale, button down collar shirt and corduroy pants. His hair was blunt cut and reached his ears, and he sported a mustache and side burns. 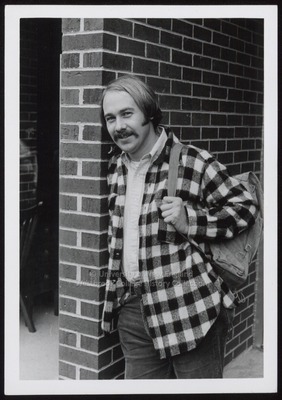 Roger poses outside of Blewett Science Center, with a knapsack over his left shoulder.